MOSCOW, March 19. /TASS/. Outcome of the Russian presidential election has been annulled at five ballot stations in three regions, Russian Election Commission’s head Ella Pamfilova said on Monday. "I have information now on the cancellation of election results at five polling stations in three Russian regions," Pamfilova said. "Our goal is to ensure the maximum trust in the election," she stressed. Any violations need to be revealed and those guilty should be punished, Pamfilova noted. The Central Election Commission received no complaints about serious violations during the voting, she said. 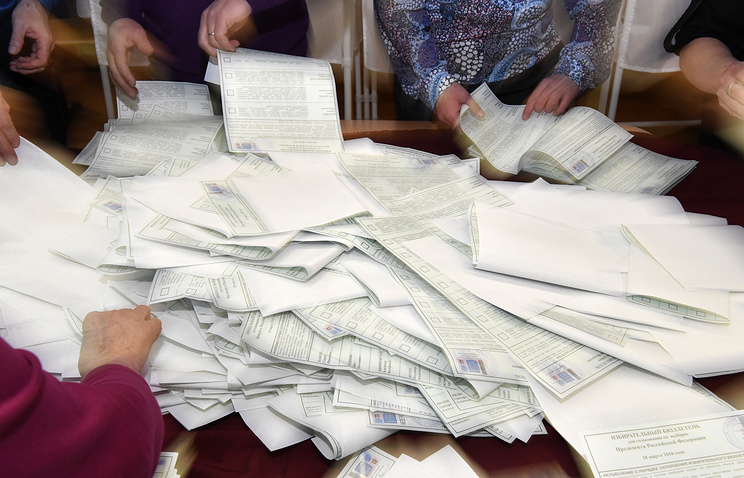 "Serious complaints have not yet been recorded," Pamfilova said, noting that all candidates and their parties could file complaints if there are any grounds for that. "We will consider them very carefully before summing up the results." Russia’s incumbent head of state Vladimir Putin garnered 76.66% of the vote in the March 18 election with 99.84% of the ballots counted, the Central Election Commission said. Director of the Lenin State Farm Pavel Grudinin, nominated by the Communist Party of Russia, is second with 11.80% of the vote, while leader of the Liberal Democratic Party of Russia (LDPR) Vladimir Zhirinovsky is third with 5.66%.